New York City, NY, US – June 7, 2010 – Cocoon Innovations, LLC, a DMC Worldwide company and leading provider of original, organizational solutions, has once again designed two compelling, critically acclaimed products, The Harlem and The Gramercy, which are targeted at the iPad. As a complement to Apple's release of the iPad, Cocoon's iPad cases, launched in April, have been met with an incredible response and increasing popularity by consumers and the media. Macworld said, "If you’re looking for an 'iPad lifestyle' bag, this is a unique, quality option… a solid bag with good stitching, a unique design, and a comfortable feel..." Known for products that offer innovative digital device storage, Cocoon is once again offering unmatched organization solutions for today’s evolving, digital lifestyle. "Apple's iPad was this year's most anticipated tech item, and we were excited to be a part of the excitement by designing exclusive iPad cases that remain consistent with Cocoon’s concept of stylish, functional, innovative organization," says Philip Petracca, Vice President of Product Development for Cocoon Innovations. "With the Gramercy and Harlem iPad bags, named after two of New York City's most popular neighborhoods, Cocoon takes organization to the next level, not only providing a stylish case for gear but also innovating the design to incorporate organization options for other tech accessories and personal items carried everyday." 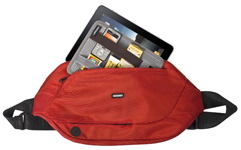 Cocoon's Gramercy is a vertically designed, lightweight, compact messenger sling with an adjustable shoulder strap. This new messenger bag features an easy-access windowed front pocket, which allows for touch screen usage and operation while the device is securely stored away. The pocket is compatible with the Apple iPhone, iPod Touch, or other Smartphones or MP3 players. The Harlem is a modernized "fanny pack" designed to be worn across your back as a comfortable and secure storage option for your iPad. And because the Harlem is water resistant, sudden rainstorms or a day at the beach are no problem for tech accessories. Both bags are complete with Cocoon’s GRID-IT™, a patent-pending organization system made up of a unique weave of rubberized elastic bands that acts as an object retention system to keep additional accessories and personal items in place. The Gramercy (CGB150) and Harlem (CSN346) are available in three bright color ways: Black with Burst Yellow interior, Gun Gray with Orange interior, and Racing Red with Java Brown interior. Available for purchase on www.cocooninnovations.com and at select retailers nationwide. The Gramercy retails for $29.99, and the Harlem retails for $54.99. Cocoon products are an ideal solution for business travelers, students, busy moms, traveling tourists, and everyday tech junkies, protecting and organizing personal and digital devices. Each bag and case is designed with an organic, innovative shape, which serves as a protective shell to safely transport your virtual cargo and redefine the way you stay organized in an ever-increasing digital world. Cocoon's design language and style provides consumers with superior functioning bags and accessories that are also highly stylized. Wrapped in their Cocoon, today’s precious personal cargo is good to go.